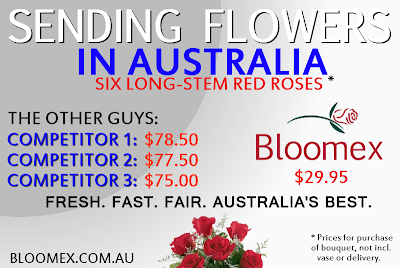 Bloomex offers the lowest prices on red rose arrangements in Australia. Bloomex has been a tremendous success in Australia and it's easy to see why when looking at the company's prices compared to the competition. In addition to offering only the best-quality flowers and awesome customer service, the other guys can't compete with our prices. Don't believe us? Have a look at this. Take a simple arrangement of six long-stem red roses, with no vase included. There are three other major online florists in Australia. Petals sells the six roses and greenery for $78.50 AUD. Interflora sells the arrangement for $77.50 AUD. And Ready Flowers sells it for $75.00 AUD. Meanwhile, Bloomex offers six long stem red roses and greenery for $29.95 AUD, a savings of 60% over the lowest-priced competitor. But it doesn't stop with roses. From popular Gerbera Daisy bouquets to elaborate arrangements, Bloomex's prices routinely blow away the competition. Why is this? It comes down to the business model. We just wrote about this last week -- albeit about our North American operations -- but the same model largely applies. Have a look here if you'd like to find out more.